I cringed at the words even while they were escaping my mouth. The problem was that the worship service we had planned that week was bursting with songs, creativity, prayers and an ambitious sermon. Squeezing it all in before the congregation started eying the exits would be no easy task. So fewer baptisms meant that people might actually stay through the closing song. But was I really happy because less people would be experiencing the wonderful sacrament of baptism, just because it made my job easier? Do I let my family down because I’m so busy working for Christ? Do I love people because I get paid for it, or because they can help my ministry? Do I find my identity in work, rather than in being a rescued child of God? Do people wonder if I care for them just because it’s my job? Am I so busy in meetings that I don’t spend much time in prayer and listening for God’s voice? Do I make decisions based on what’s good for my career, rather than what serves the Kingdom? When people say nice things about our ministry, do I lose humility? Do I start to believe that I earn God’s love through working for Him? Is my job so all-consuming that it’s hard to make time to build relationships with those outside church? At times, I’ve had to honestly answer, “Yes” to each of these hard questions. I believe passionately in the eternal, transformative power of worship. I know that our creative God crafted us in his image to create and to experience Him deeply through soul-stirring art. Through my vocation, I’m blessed and freed to devote time to the transcendent intersection of creativity, people and God. But if I am not vigilant, guarding my heart against the shadow motivations that can creep in to my work, I can start to lose the beautiful, redemptive story that God is writing. My thread in his divine design can be twisted by the darker plot of professional Christianity. Do you have friends who are Professional Christians? Do you work in vocational ministry? How can we live and love well in the tension, being committed and passionate about full-time ministry, without falling prey to the perils of the Professional Christian life? My high school friends and I only knew a handful of chords and we’d never heard of liturgy or creating worship flow, but we believed that God could use our guitars, amps and drums in church to make a joyful noise for His glory. This was the late 1970s, and church music had been ruled for centuries by pianos and organs. But a new day was dawning. We had faith in music and in our generation, and, most importantly, in God. Our conviction was strong enough to overcome whatever stood in the way, and what stood in our way was the Woneggers and the Blacks, two families who, literally and figuratively, built our local church. These pillars of the church weren’t going to stand for long-haired upstarts messing up their hymns. The Doxology was plenty good enough for King James, they reasoned, and he wrote the Bible! They held to the “If it ain’t broke, don’t fix it” worship philosophy. The problem was, my generation knew it WAS broke, and we were convinced that a dose of fresh music, full of passion and celebration, was the fix. In the months leading up to this time, the electric guitar had broken through in youth groups, but we wanted to bring the energy to the main service. So when John Black stormed out of the service as our drummer started the first song, we stood firm. John saw the drums on stage well before church began, but he made his grand exit during the service, right down the center aisle under the stained glass cross, so that no one could miss his pious statement. We stuck to our guns when Will Wonegger yelled after sound check, “That noise is 10 decibels too loud!” He was a lot more scientific than the critics who just plugged their ears when we played. If you’re a modern worship musician, you might owe my generation a debt of gratitude. Our songs were the worship equivalent of early kite crashes, zeppelin disasters, and bi-plane hops that opened new horizons of flight. And to today, you're soaring in a wide open sky. You’re welcome. On a hot Sunday night in 1978, my friends and I performed Stairway to Heaven as the offertory in our little Nazarene Church. We covered the song with just electric guitars, bass and drums until our singer did his best Robert Plant, delivering song’s closing line like a boss: “And she’s buying a Stairway… to Heaven.” I'm not sure if I was wearing my gold spray-painted converse or my red hand-dyed hi-tops that night. If you are on a worship team today, I owe you an apology. In our rush to bring relevant music into church, we trampled over generations and traditions that came before. We didn’t consider what they thought of our fuzzed-out riffs and we didn’t give much thought to theology or lyrical content. We were just stoked that God might use music that wasn’t played by an organist in a purple dress. My generation fueled a lot of resentment and our arrogance was even louder than our Fender tube amps. We set precedents that damaged the movement of modern worship before it even had a name, (let alone CDs, radio stations and a whole industry). We hoped that a worship revolution was coming, but in a lot of churches, we just added ammunition to what became a divisive musical civil war. I’m sorry. It took me a lot of years to grow to understand that the worship God seeks is more about humility and heart than it is about whether you make music on a pipe organ or a Telecaster. This tribute from a Houston newspaper got me wondering about life and legacy. Would dedicating most of your days to draperies leave you feeling unsatisfied and empty at the end of your life? I spend my days hitting keys on a MacBook Pro. Is that any better? Do I chase so hard after inspiration and the next creative moment that I miss the quiet, salt-of-the-earth goodness that OB found in little league games, sitting on the porch and sewing curtains? Of course, obituary writers smooth over the rough parts in a life story. Were there dark places in OB's life that he kept in the shadows? What were his regrets... his secrets? Before he died, did he get to see beauty bloom from the broken places in his journey? When they put me in the ground, will people say I was devoted to my family, just like OB? Will I get a sweet nickname before I die? Lots of deep questions. I think the best part in OB’s obituary is this: “Don’s presence in our lives will be deeply missed.” I hope I can be truly present in people’s lives in a way that will be deeply missed. I think that means making the most of every opportunity to show love and grace. I guess that’s something worth shooting for, whether you work in a church, or in a drapery shop. What would you like to see written about you when you're gone? How can I offer something fresh, meaningful and compelling to a benefit concert to fight human trafficking? That was the question facing in preparation for an April 14 concert to end slavery. Here's an update on the project so far, as we prepare to see how God answers the question at the event this Sunday. For a while I've been interested in the idea of delivering a spoken word piece in collaboration with a lone singer. This concert seemed like the perfect time to take the risk and step into this mixture of media. The idea was to have no instruments, just the spoken word accompanied by a solo voice. I was rewriting my poem, Apology to a Caged Bird, to bring a stronger focus on slavery, and I believed the concept could be stark and attention grabbing, if I could find the right voice and the right song. I've admired the voice and heart of Emily Neumann for over a year. And I hoped she would be the voice for this collaboration. Emily is one of many gifted worshipper/musicians that make up WorshipMob. The Mob is a collective of worship musicians from more than a dozen Colorado Springs churches. This group comes together weekly to pray and worship at the home of Sean and Larissa Mulholland. Sean records and mixes these sessions and tens-of-thousands of people around the world are worshipping to these songs and videos through YouTube and facebook. Emily prayed about it, and was excited to dive in. Now, to find the song. Our hopes were high, but the song had to be just the right fit. We needed a radio song that would draw lots of people in. We needed lyrics about birds or flight, to connect with the poem and the words needed to bring something to the conversation about slavery. When the Beatles' classic Blackbird came on radar, I knew we had found the lyric to answer the dialogue started by the poem. I launched in to the poem at our first rehearsal, and then Emily responded with the opening lines of Blackbird. I blinked away tears as her voice turned the song into a chilling lament for a child trapped in slavery. As we traded lines, it seemed that new threads of meanings were pulled from both the song and the poem as the two wove together to create an entirely new fabric. We loved the work so much that we asked Sean if we could come to his basement studio that same night to record it at his studio. Emily and I performed the mashup live in one take, while Sean and videographer Richard Seldomridge captured the results. In Good Friday services around the world, we remember Christ's sacrifice on the cross, and the coming joy of His resurrection! I'm humbled to have two of my poems being dleivered in Good Friday services tomorrow. New LIfe Church in Yorkville, IL, will perform "This Exchange" live. This poem started from the premise, "What if I met Christ at a swap meet, and He was trading for souls?" It takes the unique approach of having two people play the characters in a dialogue. "Levi," is loosely based on me, and "Manuel" is the Christ figure in the exchange. Woodman Valley Chapel in Colorado Springs, CO, will use the video of "In the Shade of the Tree," as part of their Good Friday liturgy. In this video the poem is voiced beautifully by Amy McNielly, a talented and creative friend from Belfast, Northern Ireland. Today and every day, may God continue to seek and find us, His wayward, straggling kids, through the good work of His only begotten Son. The past week has been bubbling and fizzing with fun creative opportunities. I directed a video shoot for Easter services, and brought the poem, "Kaleidoscope," live in four worship services. I spent an evening sharing inspiration and encouragement with the Worship Team from Mission Hills Church in Littleton, and today I delivered a poem in a chapel service at Woodmen Valley. Hoping and trusting God to do what he does, and turn the water of all these words into wine. Here's video of the poem from the weekend. You can also find the lyrics here. "Yesterday he was chatting with his peanut butter and jelly sandwich,"
I was cautioned as I walked in to meet to meet the 84-year-old, retired missionary in rural China. He was deep in the grip of Alzheimer's disease. We chatted for 30 minutes, and although most of the conversation was confused and disjointed, there were two moments that stood out. When he sang a hymn, he faithfully recalled each word and note, and the look of rapture on his face was unforgettable. When he prayed for me, his words were lucid, thoughtful and powerful. These were moments of clarity for me, too. I was struck by the lasting impact of our songs and prayers. These words of eternity can remain, rooted deep in hearts and minds, even when other thoughts flee. My prayer today is that as worshipers, creatives and leaders, we will be faithful shepherds and messengers of songs and words that bring life. I'm stoked to share a couple poems as part of a night of worship at Jubilee Christian Fellowship in Lone Tree, CO tomorrow, Feb. 22. I always love connecting with worshipers and worship teams at new churches, but this time I'll also have the joy of reuniting with Nate Rees. Nate is Jubilee's worship pastor, and he and I served together for years at Woodmen Valley Chapel. Nate is a gifted and passionate worship leader and has been a big inspiration and encouragement to me as I've tried to walk out this strange calling as a worship poet. I love how God graces His people with these Kingdom connections. 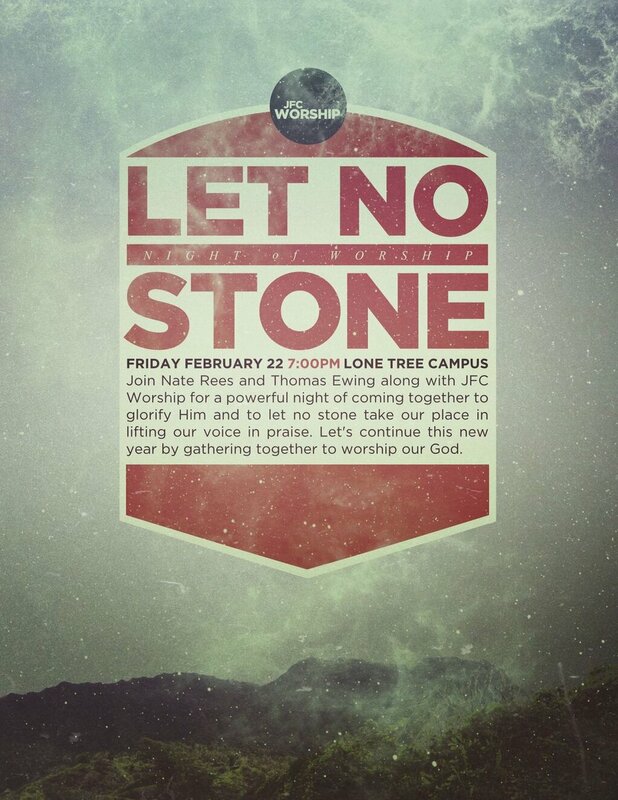 Excited to join the Jubilee community in giving Him all the glory tomorrow night! Branding is everywhere these days. From cars to guitars to people to cities, we are all concerned about creating a reputation that makes us instantly recognizable and widely known. What’s our worship community’s brand? Are we known for facilitating dynamic worship services? For stirring visuals? Creativity? Tight harmonies? Crystal clear audio? Do we have a reputation for slamming guitars and tight rhythms? What would it look like if we all made loving one another our highest priority? What if love was more important than fat guitar tones? What if it was more important to me than people hearing my bass in the mix? What if love was more important than what style of music we played? What if it was more important proving I’m right? Radical stuff. If love is so all important, and if it's to be our brand, how do we practically love each other in a worship community? Paul gives us a big hint in Galatians 5:13, when he calls us to “serve one another in love.” It seems that love and service merge together in God’s kingdom. Service and humility go hand in hand too. “…Clothe yourselves with humility toward one another, because God opposes the proud, but gives grace to the humble.” -- 1 Peter 5:5. Humility toward one another is the key that places us under the grace of this powerful promise! Jesus combined a formula for greatness with a personal mission statement in Mark 10:43-45, “…Whoever wants to become great among you must be your servant, and whoever wants to be first must be slave of all. For even the Son of Man did not come to be served, but to serve, and to give his life as a ransom for many.” If Jesus came to serve, and we desire to be His people, can we do anything less? I hope you’ll join me in praying that the Lord will grant worship communities the grace to humbly serve one another, that we would be known as His people, and that our trademark would be love. The words above are from a letter written in 1863.The new song the writer referred to was "Just as I Am." Sometimes we treat our worship gatherings like ordering a burrito at Chipotle. We each have our favorite combination of ingredients that make us smile. Why is the weekend service such a hot and spicy source of disagreement? When you peel back the tortilla, here are a couple reasons that add heat to the debate. Like tomatillo red chili salsa, one ingredient that brings fire to worship discussions is time. Often we have tend to minimize worship to an hour-and-a-half on Sunday, or even further to just the music time in the service. Thirty minutes-a-week for worship? That leaves 167-and-a-half hours for other good things like family, friends and Chipotle, but it leaves out a vital truth Pastor Matt shared in our worship series: Worship is our active ALL OF LIFE response to the worth of who God is and what he does. If we really believe life revolves around the worship of God, we won’t find ourselves quite so tightly wound about hearing our favorite song on Sunday. Here’s a question to chew on: If we’re designed to worship and we sometimes limit worshipping God to weekend services, what do we worship the rest of the time? Steak? Chicken? Carnitas? No matter how much you enjoy guacamole and lime rice, there’s always one central ingredient that lays the flavor-foundation for your burrito. So what’s the foundation for our worship services? True worship is first and foremost about God, not us. It should be a response to Him and a proclamation of His revealed glory. Through his grace, worship should be our offering to our Holy King, not entertainment. Russell’s words highlight the important reality that worship is not for us. Sadly, this truth is not widely understood in American churches. A recent study by George Barna found that church attendees were most likely to view worship as an activity undertaken for their personal benefit. Only three out of ten saw worship as something focused primarily on God. Sometimes we treat the service like we’re Simon on American Idol. If we become passionate participants in corporate worship directed toward God, then does the worship leader’s outfit matter? Do I really need my favorite style of music to worship Jesus? Every time we go to Chipotle my daughter orders a vegetarian burrito bowl. To me, this misses the whole point. Might as well order a salad. I have my own prejudices when it comes to worship music too. For example, it’s clear to me that country music has no place in the Kingdom of God. But I think Rick Warren has a more theologically accurate and helpful perspective: “There is no style of music that God does not enjoy.” While the Bible tells us that music plays an important role in worship and fellowship, the scriptures never advocate a particular style. When we think we're debating Biblical styles and forms, aren’t we often just defending our own deeply-felt preferences? Often we guard what is nostalgic rather than what serves the church best. John McArthur notes, “We continually are told in the Psalms that the word “song” is connected with the adjective “new”... new song, new song. In fact, more than anything new in Psalms is the new song. And it’s the song of the redeemed.” The church might not be singing the music we grew up with, but are we willing to lay our favorites aside to bless our brothers and sisters? God has humbled me through worshiping with believers on four continents, in dozens of languages, and in settings ranging from an abandoned Soviet military base to an island in the Nile River. Some of the richest, most God-breathed worship services I’ve experienced have been with a handful of believers and a lone guitar. It quickly becomes apparent in these times that when we gather for worship, we’re not an audience attending a show; we’re participating in an offering of praise to our risen Lord. Often I come to weekend services ready to order up my favorite worship like a shining silver Chipotle burrito. But Paul rips the foil off this feel-good philosophy in Phillipians 2: “Do nothing from rivalry or conceit, but in humility count others more significant than yourselves.” In John 13, Jesus called his people to be known for one thing: Their love one another. How would our preferences be torpedoed if we each adopted an attitude of loving one another as we gathered to worship? I hope you’ll join me in praying that, as a church, our worship services would be marked by Christ’s love. Ever notice how many great theologians go by their initials: C.S. Lewis, G.K. Chesterton, and A.W. Towser. Today we’ll look at the Gospel according to that great theologian P. F. Chang. Last week I headed out to P.F. Chang’s Chinese Bistro with a group of friends for dinner and dessert to celebrate a birthday. The conversation was flowing, and we glanced at the dinner menu and decided what we wanted for dinner. Almond Chicken sounded great to me. We also ordered appetizers to share. We all downed a few bites of spring rolls, calamari, and lettuce wraps (a personal favorite of mine). After salads and wonton soup, the main course arrived. There was Kung Pao Chicken, Orange Peel Shrimp, Sweet and Sour Pork, Mongolian beef, and even some healthy dinner salads. And of course lots of rice and noodles to go around. About half way through dinner it hit me: I was starting to feel a little full. After a few more bites, I began to think that fitting in dessert was not gonna’ happen for me. A few minutes later the waitress came and asked if we wanted to see dessert menus. There were raised eyebrows and questioning looks around the table, but a few of the heartier appetites agreed to at least scan the menu. Those desserts sounded great. But I was stuffed. Someone even said that just looking at the menu was giving him indigestion. A couple of folks with heartier appetites ended up splitting slices of the “Great Wall of Chocolate:” Six layers of rich chocolate cake with dark chocolate chips and a raspberry sauce. They were so full that they didn’t really enjoy it much. And by the time they got their desserts many of us were ready to go, so they rushed through a few bites and called it good. That’s when it hit me: Sometimes we treat God like dessert at P.F. Chang’s. We start each day like a trip to the restaurant fully intending to work God in to a busy schedule crammed full with lettuce wraps, shrimp, and noodles, you name it. Maybe the appetizer at your life restaurant is The Today Show, or the morning newspaper. Maybe the main course is a full day at the office, or even a Saturday hike with the family. Maybe my combo platter includes along commute home, Maybe you’ve got a side dish of Walking Dead or American Idol in the evening, or maybe it’s setting up for dinner over at the church. Now many of the things that leave our lives too full for God are great and as healthy as a chicken salad. What are some of those things for you? The problem comes when we’d planned to include dessert at the life restaurant, but all these other things leave us so full that we’ve got no room for the sweetest part of life… Our relationship with Christ. You find yourself skipping it altogether, or shoveling it in so fast that you can’t enjoy it. If we’re not intentional about it, our relationship with God will end up being rushed, unsatisfying, or skipped all together after a full menu of life’s business. The question for me is: How do we make sure that our daily trip to the restaurant of life leaves room for God? Once when Jesus was eating at the home of a prominent Pharisee, he had a few things to say about a fancy dinner. Check out Luke 14:15-23 for a few of Jesus’ ideas on The Great Banquet. All content on this website © Don McCaleb 2010 - 2019.